Long an important resource, San Solomon Springs was likely visited by Spanish explorer Antonio de Espejo in 1583. Centuries later, settlers arrived in the arid region, built irrigation ditches, and began farming. In the early 20th century engineer and manager E.D. Balcom joined with investors H.R. Morrow, Joe Rhea, and John Rhea to form an irrigation company and in the process gave the town its name (Bal-mor-rhea). Seeing the headwaters of San Solomon Springs as an attractive location for a park, the State Parks Board acquired the land in 1934. The next year, the CCC began construction of a huge double-wing swimming pool at those headwaters. Using local limestone and adobe bricks, the enrollees of Company 1856, largely area residents, soon completed roads, buildings, bridges, and irrigation conduits throughout the forty-six-acre park. Architect William G. Wuehrman led a team of architects that included Olin Boese, Paul E. Pressler, George T. Patrick, and F. W. Digby-Roberts through the planning and design phases. They were funded by the National Park Service and employed by the State Parks Board. Among the notable buildings are the caretaker’s residence and San Solomon Courts. A paean to early automobilists traveling on U.S. Highway 290, the courts were distinctive one-story, red tile-roofed, white-plastered adobe brick cabins that had garages in each of the eighteen units. 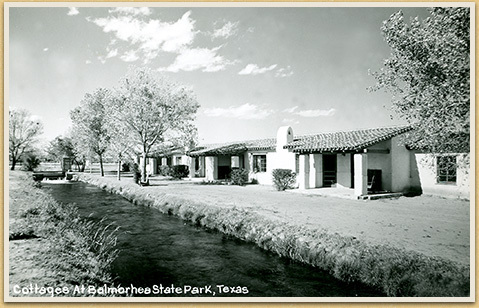 Soon after Company 1856 left in January 1940, Balmorhea State Park had become both a center for travelers touring the region by car and a gateway stop for those heading to the Davis Mountains.